What is Friends of the Holy Land? Archbishop Vincent Nichols led the first diocesan pilgrimage to the Holy Land in autumn 2007, at which time he called on his fellow pilgrims to support their brothers and sisters through – Prayers, Solidarity and future Pilgrimages. Once the pilgrims had returned home, a small group from Worcester worked together to answer Archbishop Nichols’ call. 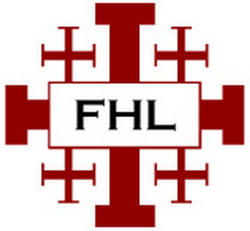 The immediate success of this little group encouraged like-minded people to forge ahead to form a national charity “Friends of the Holy Land” (FHL). What do Worcester FHL do? We raise awareness about the plight of the people of the Holy Lands and offer ways to improve their lives. We organise events to raise funds for our projects in the Holy Land, mainly for the School of Joy. We collect materials and clothing that are useful for our projects then send or deliver them by hand. We form links with other groups in order to increase our effectiveness in helping the people of the Holy Lands. The Worcester group meets monthly on the 2nd Thursday of the month in St George's Parish Hall at 7:30pm (except August). Notice is given in the parish newsletter.